Are your social media efforts generating any sales? In the hunt of the tricks that can help you do so? Social media has the power of generating quite remarkable results in terms of sales. In fact, a study found that 78.6% of sales people who are using social media to sell out performed those who weren’t using social media. 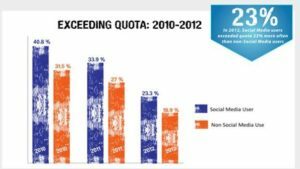 When talking about exceeding sales quota by more than 10%, social media users were 23% more successful than their non-social media peers. What’s more is that over 40% of correspondents said they’ve closed between two and five deals as a result of social media. Considering the fact that these studies were conducted in 2012, it is safe to say that these numbers have most likely increased because the popularity of social media has done nothing but grow since then. In this article, I’ll teach you the top social media methods that will help you sell more. You probably know that creating an account on all social media platforms you can come across, then trying to juggle them isn’t a recipe for success. Instead, you want to focus on a few core network that you can put all your efforts into. 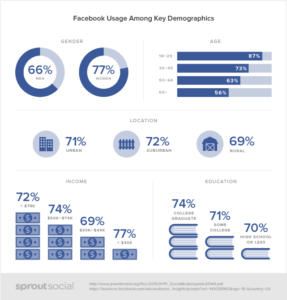 The main deciding factor of which platforms you want to choose is your audience. All platforms are different. Some are heavily used by women, some are heavily used by teenagers, some are popular among both genders. In order to choose the platforms that are right for you, assessing where your customers are most active is key. A great place to start is to learn where your audience is talking most about your brand. There is also plenty to learn from your competitors. Where are they spending their efforts? Where your competitors are, there is a chance your customers are as well. Unless your competitors have no idea of what they are doing. 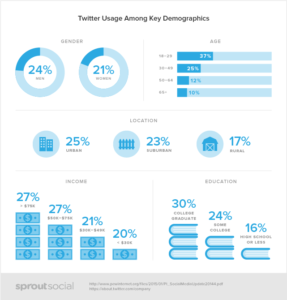 What you can also do is to look at the user demographics across some of the platforms you are considering using. Which platforms have the most users who fall into your category? A common mistake many brands do is to believe that the more platforms they are active on, the better results they’ll have. And it’s easy to understand why they believe that. More places to be seen = more exposure = better results. The only thing is that it means spreading your efforts across all platforms (generating “meh” results) instead of focusing on a few core networks (generating impressive results). People don’t want to go through step after step – and through a lot of trouble just to buy something from you. If your shopping process is too complicated, there’s a big chance you’ll end up scaring away quite a lot of people. One click should be enough to get them to where they want to be. Avoid any redirects and the demand for on-page clicks that makes the shopping a hassle instead of a pleasant experience. Of course, if you have an allocated budget for your social media, it’s not a bad idea to use them. Ads often offer more to choose from when it comes to linking and landing pages and create a better shopping experience for the customer. Instagram just recently introduced shoppable posts to make the platform more attractive for business. 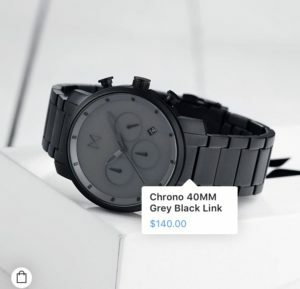 As of now, the feature is only available for verified accounts, and if you still want to benefit from “shoppable posts”, Instagram Ads is the thing to opt for. 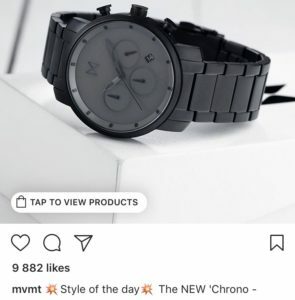 MVMT watches have gotten their Instagram account verified and uses the stoppable feature on almost all their posts, creating a seamless shopping experience for their customers. A simple tap on the screen presents what the product is and how much it costs. Two of the most common questions brands receive on social media now answered. Lastly, you have the call-to-action button. Tap that and you’ll be directed to the place where you can shop that exact piece. What would the purpose be if people would just be redirected to the homepage? It would only mean the people interested have to spend efforts trying to find the piece they’ve just seen on Instagram. Of course, Instagram is not the only platform that has this feature. Pinterest has rich pins, and Twitter has clickable links. Something that Instagram doesn’t. This step is critical for driving sales through social media. Almost all visitors who’ll click through to shop something from your website will be on their phone. If you are putting a lot of effort into generating sales on social media, then don’t have a mobile optimized website, you are shooting yourself in the foot. If you’ve ever visited a website that isn’t mobile friendly with your phone before, you know what I am talking about. In fact, a study which studied website visitor experiences found that 52% of mobile site visitors said that a bad website experience mobile made them less likely to engage with a brand. Moreover, 48% said that a bad experience resulted in them seeing it as the brand didn’t care about their business. If you, on the other hand, have optimized your website and made it user-friendly, you’ll benefit from it. In a study conducted by Google, they found that 67% are more likely to buy a product on a mobile-friendly site. Finding out if your website is mobile friendly is simple! With Google’s mobile friendly test, you can quickly find out if your website offers a good mobile experience by being mobile friendly. You also want to look at your page’s page speed as this also affects the user experience. 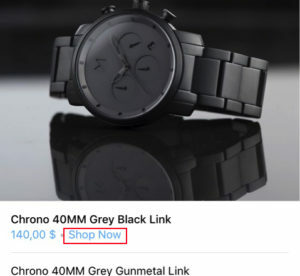 How long does it take to get from social media to your website checkout? Is the time longer than it should be because your website is slow? You’ve created killer content, and you’ve added a link in your bio or in you caption – depending on which platform you use. But you still aren’t seeing any results. Are you including a strong call to action? Social media offers several places where you can include call to actions. On Instagram, you have three places where you can share links. In your bio, in Stories, and through Direct Message. Obviously, your profile is one of the most important sources for driving traffic, no matter which social platform you use, so you want to take advantage of it. Thankfully, you also have a bio where you can write about yourself, and this means a place where you can include a call to action. You can see a lot of people using their bio space to include a call to action to their website, and that’s proof that it works! 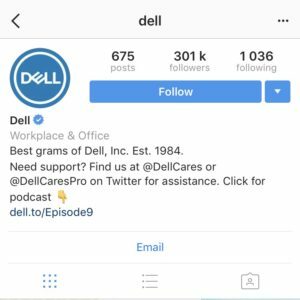 Dell uses their bio space to include a call to action to their podcast. If you are using ads, you have a more wide choice of call to actions. These allow you to choose from a variety of different call to action buttons. If you don’t use ads, it might be a good idea to consider it, because these buttons are far more powerful than a call to action in your caption. By including a clear call to action, you let people know what they should do, and not surprisingly, it is able to generate tremendous results. It’s incredible that simply telling people what to do can make such a huge difference. Here is Dollar shave Club’s Facebook profile seen with a “Sign up” call to action. 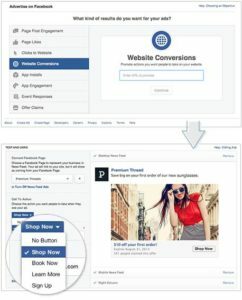 When setting up a Facebook ad, you can choose from even more buttons, such as shop now, book now, sign up, learn more etc. It’s impossible to write an article on increasing social media sales without mentioning influencers marketing, and that’s because it works! Influencer marketing campaigns generate $6.85 for every $1.00 invested. If you think about it, it’s not strange at all that influencer marketing can generate these results. 92% of Consumers Trust Peer Recommendations Over Advertising, which means that brands have very limited trust in what they are saying. Everyone already knows what companies are after, right? Thankfully, you can now lean on influencers in your marketing and efforts to generate more sales on social media. Because influencers have built a highly targeted following of individuals who are interested in the niche the influencer is, it is a perfect opportunity for brands who are within that industry as well, because this means a highly effective way of reaching your target audience. In addition to that, influencers have over a period of time build their trust and credibility which means their followers look up to them and trust their recommendations. The key to running a successful influencer campaign is, of course, that you work with influencers who actually are within your industry and have a following of people who are your target audience. Secondly, you want to work with influencers who have an engaged audience and actually have a real influence over people. 75% of marketers, says that finding the right influencers the most challenging part of influencer marketing, and that’s understandable! There are so many components that have to be right. However, with the help of Veloce Influencer directory, you can filter influencers based on your preferred criteria, and as a result be presented with the most relevant influencers for you, based on the criteria you chose. When looking to increase sales, what you really want to do is offer a better experience for your customers. You want to make it possible to shop from you in fewer steps, make the process run quicker, for example by optimizing your website load time. If you think about it, all you’re doing when increasing your sales with social media is to simply make the process of going from A to B quicker and more pleasant. Whether it be making it easier for people to find you by choosing the right platforms, or working with influencers, whether you are optimizing your call to actions so that people can know what to click to get where they want, or, optimizing your website. They all do one thing and having that in mind when increasing sales is vital for success. Ask the question “How can I improve my customers’ shopping experiences”.